KARAKUWA, Miyagi Pref. 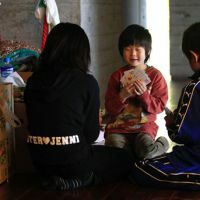 — Zoom in for a snapshot of apparent normalcy: children sitting in a circle, clasping playing cards tightly in their hands. They laugh, chat and occasionally hop up to break into a goofy dance. Zoom out and the picture changes: The children are kneeling on mattresses in a chilly classroom they now call home. An elderly woman cries nearby, wondering whether her mother was killed by the tsunami. Outside the school, a teacher fiddles with a radiation detector, checking to ensure the levels aren’t high enough to make them sick — or worse. Behind the smiling faces of thousands of children in shelters across this wave-battered wasteland, experts say there is often serious anxiety as everything these youngsters once held as normal is suddenly anything but. For the children, the monster in the closet has been replaced by the monster of Mother Nature: The ground they play on can rattle and crack, the ocean they swim in can morph into a killer wave, the air they breathe might carry harmful radioactive particles. Fumie Unoura, 10, remembers well the terror of the day. She was sitting in class when the earth began to shake, sending her and her classmates scrambling under their desks for cover. When the rumbling stopped, the teacher shepherded the students outside, where their town had turned to rubble. “I saw the dust rising up,” she recalled days later, standing outside a shelter in the shattered coastal city of Rikuzentakata. With the tsunami coming, she ran as fast as her short legs could carry her, surrounded by others sprinting for safety. She escaped with her life but little else. Her home is ruined. She sleeps on the floor of a school gym with her family and more than a thousand other survivors. She misses her Nintendo DS. Her father, Masanari, volunteers at the shelter. He worries constantly about what will become of his life, where they’ll live, how he will clean up the ruins of their home. It is not so simple, experts said. In fact, the disruption of daily life, if prolonged, can be more damaging than the disaster itself, said psychologist Gaithri Fernando, who led a study on how the 2004 Indian Ocean tsunami affected children in Sri Lanka. Suddenly discovering they have no water to bathe in, no bed of their own and no school where they can see their friends can be highly upsetting, said Fernando, a professor at California State University, Los Angeles. Experts say getting children back into a routine — even an unusual one — is key. Unoura and his family are doing this. Every morning, they join others at the shelter for group exercise sessions broadcast on the radio. They have breakfast as a family, and then Fumie and her older sister, Shiho, have time to play until they all meet for lunch. Fumie’s teacher stops by regularly with homework assignments — a source of complaint for his daughter, her father notes with a grin. That kind of basic structure to the day helps prevent long-term psychological damage, said Burke, the Australian psychologist. 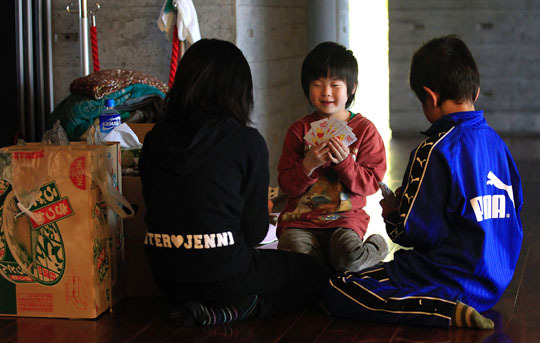 Save the Children, an international aid agency, has set up safe spaces for children to meet and play throughout the tsunami zone, with toys, games, crayons and paper.